Rabbinical author; born at Safed 1709; died there 1784. He was sent by the Safed community to Europe to collect ḥaluḳḳah. From 1755 to 1776 he lived at Constantinople, returning in his old age to Safed. He left a number of manuscripts, two of which have been published—"Ṭib Giṭṭin," a treatise on divorce (Jerusalem, n.d.), and "Sefer Ḥayyim le-'Olam," responsa, 2 vols. (Smyrna, 1785). 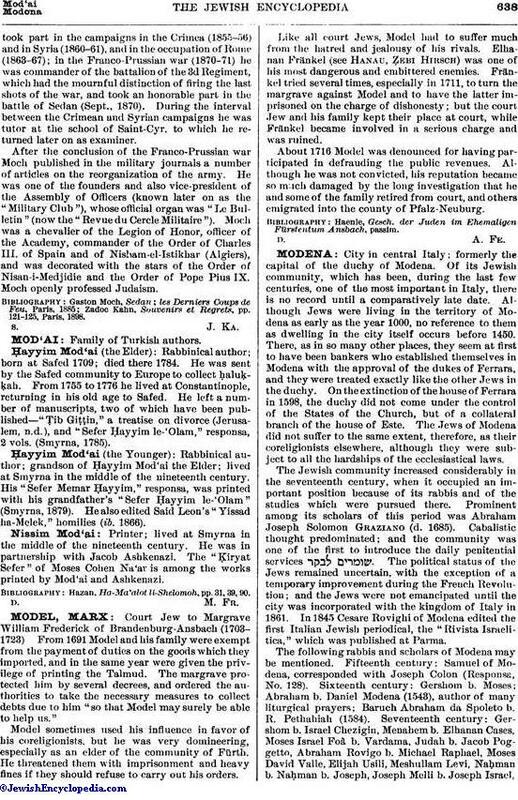 Rabbinical author; grandson of Ḥayyim Mod'ai the Elder; lived at Smyrna in the middle of the nineteenth century. His "Sefer Memar Ḥayyim," responsa, was printed with his grandfather's "Sefer Ḥayyim le-'Olam" (Smyrna, 1879). He also edited Said Leon's "Yissad ha-Melek," homilies (ib. 1866). Printer; lived at Smyrna in the middle of the nineteenth century. He was in partnership with Jacob Ashkenazi. The "Ḳiryat Sefer" of Moses Cohen Na'ar is among the works printed by Mod'ai and Ashkenazi. Hazan, Ha-Ma'alot li-Shelomoh, pp. 31, 39, 90.